All submitted papers are subject to strict single-blind peer review process by at least two independent reviewers in the relevant filed of the particular paper, followed by a final acceptance/rejection decision by the Editor-in-Chief, or another Academic Editor approved by the Editor-in-Chief. 1. All manuscripts are submitted and processed using the online ScholarOne Manuscripts System or Hapres Manuscript Processing System. 2. Once the submission is received, the Editorial Office will do the initial check against the journal’s Guide for Authors to ensure that it includes the required information and is within the journal’s scope. Poorly prepared manuscripts will be rejected immediately. 3. An Academic Editor will be contacted to pre-check the manuscript and suggest if it is worthy of further processing. If the Academic Editor finds the manuscript of insufficient quality, it will be rejected immediately without further peer review. 4. If the manuscript has passed the pre-check, it will go through a rigorous plagiarism check, and then be assigned a Handling Editor who does not have any potential conflict of interest with any of the manuscript’s authors to handle it. Any manuscript with plagiarism will be rejected immediately. 5. The Handling Editor will monitor the peer-review process. A number of external reviewers will be invited to review the manuscript, provided that they do not have any conflict of interest with any of the authors. 6. The Handling Editor will make a recommendation decision (Accept for publication/Minor revisions required/Major revisions required/Reject/Ask for another reviewer) based on at least two reviewers’ comments and forward this recommendation decision to the Editorial Office. 7. If the manuscript needs to be revised, the Editorial Office will directly forward the critical comments in combination with the revision decision to the authors for revision within a given deadline. 8. If the manuscript is recommended to be accepted or rejected, the Editorial Office will forward the decision to the Editor-in-Chief for final approval. 9. Each accepted manuscript will be forwarded to the Product Editors for editing and rapid online publication. 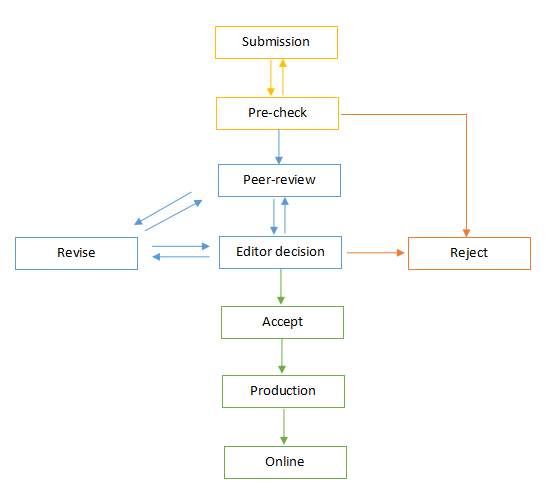 A summary of the editorial process is given in the flow charts below.